Arras was a major Allied offensive, fought in the Spring of 1917. Falling chronologically between the much higher profile battles of the Somme in the second half of 1916, and Passchendaele (or Third Ypres) in the second half of 1917, Arras is a battle that is not particularly well remembered today. The battlefields also are much less known than those of the Somme and Flanders, and less visited. However, there is a great deal to see around the Arras battlefields today. It is a large area, and deserves a section of its own; however at this point I have added only two pages to the website which deal, very roughly speaking, with the area to the east and south-east of Arras (this page) and the areas north and north-east of the city (Arras - (1)). There is much to see and several days are needed to properly cover and understand the area. Several guidebooks are available which cover Arras; there is a section in the Holt's Concise Guide to the Western Front - North, and an excellent guide devoted to the Arras battles and battlefields is Paul Reed's Walking Arras, published in the Battleground Europe series by Pen & Sword in 2007. This village is located about five miles east of Arras, just to the north east of where the N39 (D939) meets the A1 Autoroute. 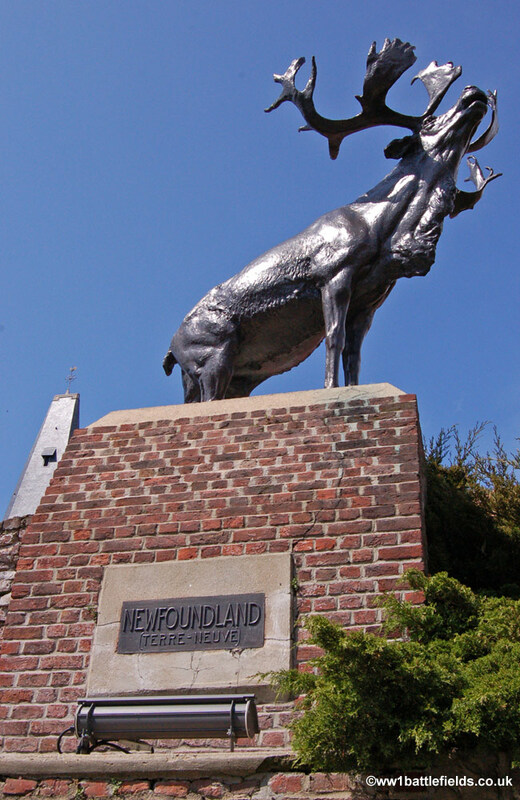 In the centre of the village, at the crossroads where the D33 and D33E meet, is the Caribou Memorial to the Newfoundland Regiment. The location of this memorial is very close to the site of the Chateau. A plaque on the brick base explains that the memorial is here to honour the 'courage and sacrifice of members of the Newfoundland Regiment who, on the morning of April 14th, 1917, pressed into a salient that a thin British artillery barrage had created in the German line immediately east of this point'. It goes on to explain that this was the first Allied forces encounter with the German "elastic defence in depth", a tactic where alternate strong and weak points along the front line sought to trap attacking troops. 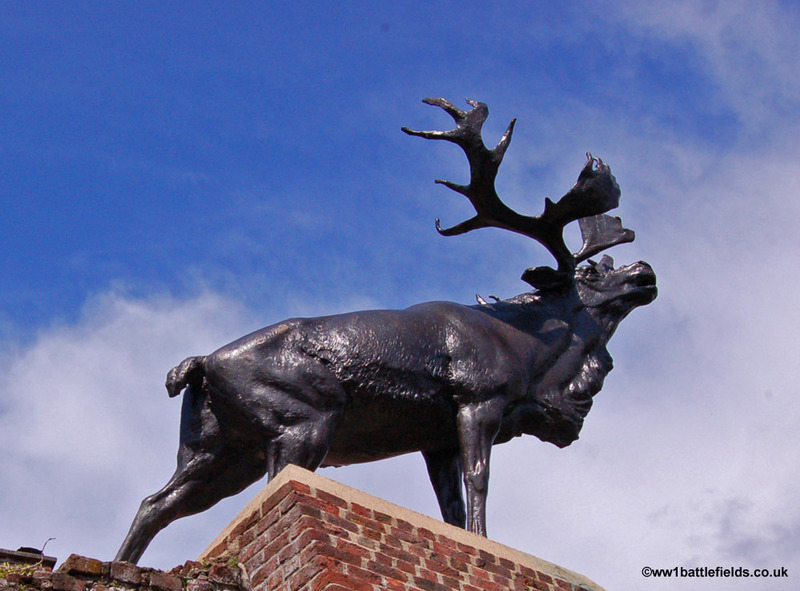 The Newfoundlers advanced to Infantry Hill, about three-quarters of a mile due east of where the Caribou now stands, and were then encicrled by the Germans and cut off. The village of Monchy-le-Preux was then defended only by about 20 men, ten of whom managed to reach a bank of earth just east of the village where they sought protection from the German artillery fire. However, these few men then held up the German forces preparing to attack the village for four hours until reinforcements arrived. It is estimated that this saved many thousands of lives which would have been lost in retaking the village if it had fallen. However, the Newfoundlanders themselves suffered badly - 166 were killed, 141 wounded and 153 taken prisoner. 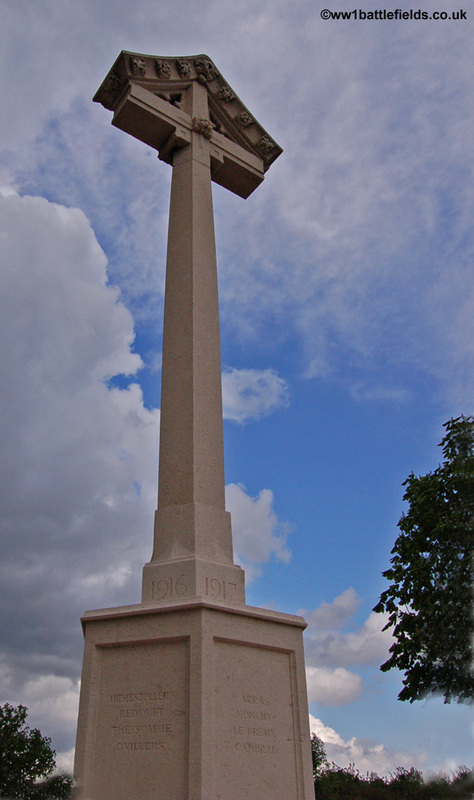 Located by the church is the village war memorial, which as an inscription on one side records, was erected with help from the Isle of Wight. 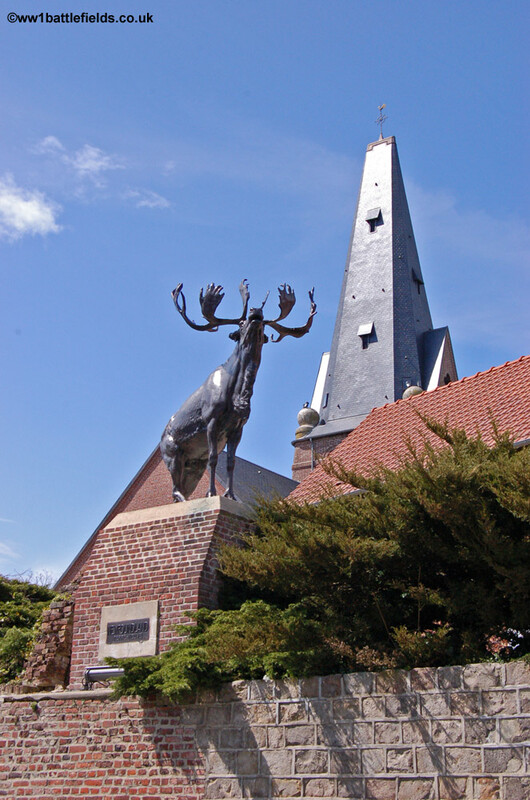 Also within the village, located on a sharp bend of the road south-west of the Caribou, is a Memorial to the 37th Division. Rough steps on the left side lead up to the memorial, whcih is in the form of a stone pedestal with blocks and with three soldiers on the top holding their rifles in front of them. On the front of the memorial, under the inverted horseshoe insignia of the Division are the words "To the memory of the Officers and Men 37th English Division who fell in the Great War 1915-1918" - the dates presumably reflecting the fact that the 37th Division began its overseas service in summer 1915. On the sides of the pedestal are listed the battles the Division fought in, and the units which made it up. 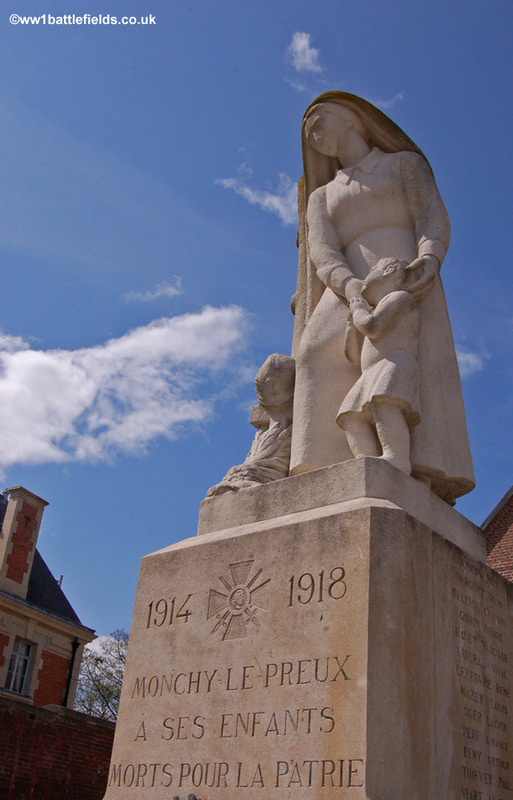 Among the battle honours listed are the Somme, Third Ypres, Arras and of course Monchy-le-Preux (11th April 1917). The 37th Division (which was originally numbered the 44th Division) was comprised of units from other New Army Divisions, and so their training on Salisbury Plain before proceeding overseas was intense but relatively brief. On the 25th of June, the King inspected troops of the Division at Sidbury Hill, a Iron Age hillfort not far from Tidworth which remains part of the Army training area today, offering spectacular views over Salisbury Plain. 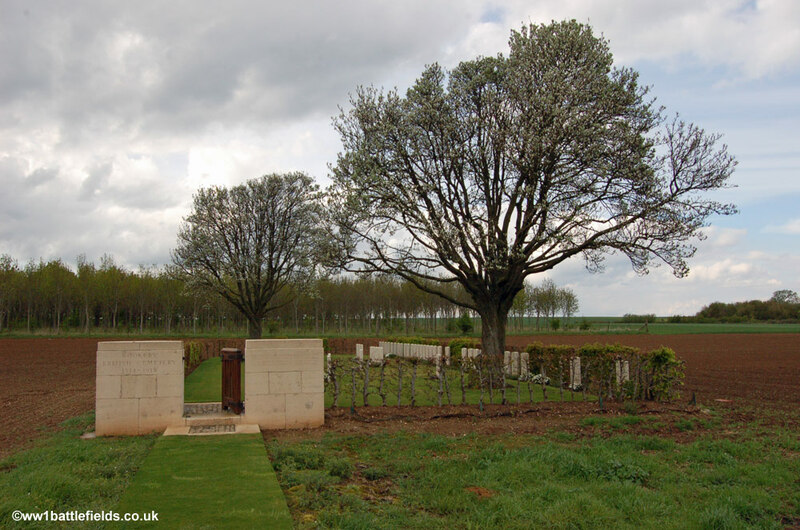 To the west of the village, reached by following the road towards Fampoux and then a track leading off to the left, is Monchy British Cemetery. During the war, the track leading to the cemetery was known as Sword Lane. The entrance to the cemetery frames an archway within, behind which is the Stone of Remembrance (left photo below). 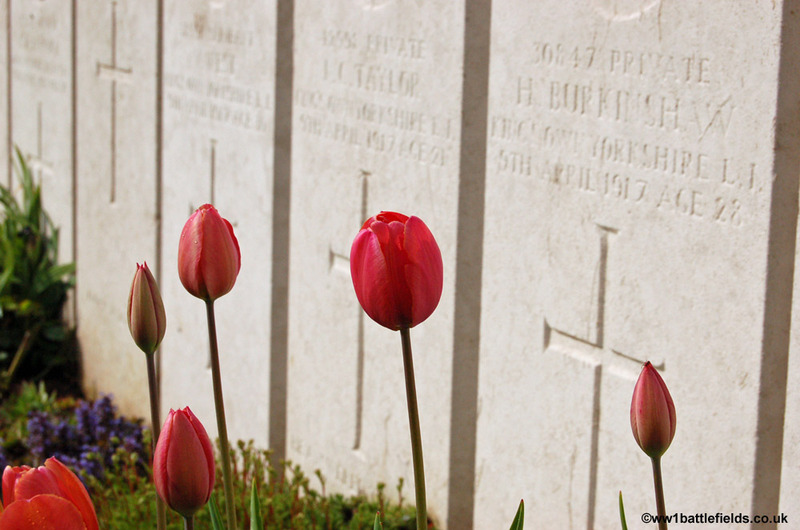 The cemetery was started immediately after the village was taken on the 11th of April 1917. It was used until March the following year, when the Germans took the area again in their Spring Offensive, and it was the Canadian Corps who recaptured the area on the 26th of August 1918. There are 581 men buried or commemorated in this cemetery, 58 of whom are unknown. Several headstones of men from the Royal Fusiliers show the date of death as 10th/11th April 1917. 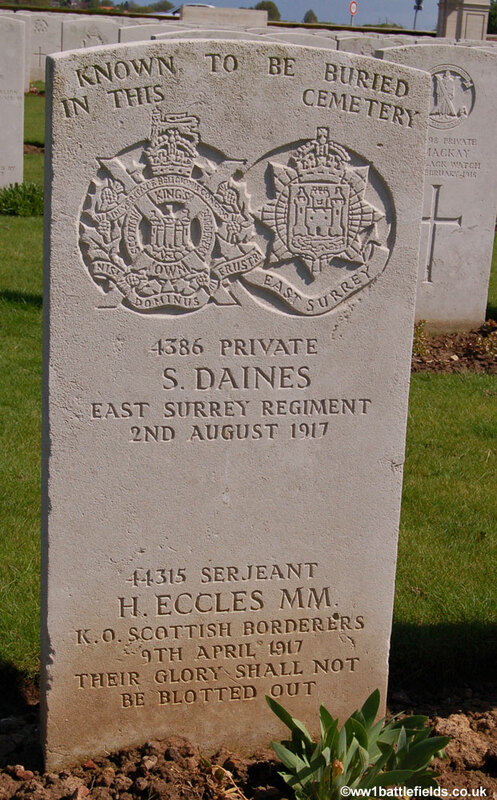 At the end of row 2D is a special memorial stone bearing two names (Private Stanley Daines and Serjeant Harry Eccles) and the words 'Known to be buried in this cemetery', although the two men died four months apart. Not far from the cemetery a new factory and industrial estate was constructed in the 1990s. This can be seen across the fields to the west of the cemetery. Prior to building work starting, the Arras Archaeological Society discovered the bodies of 27 British soldiers. 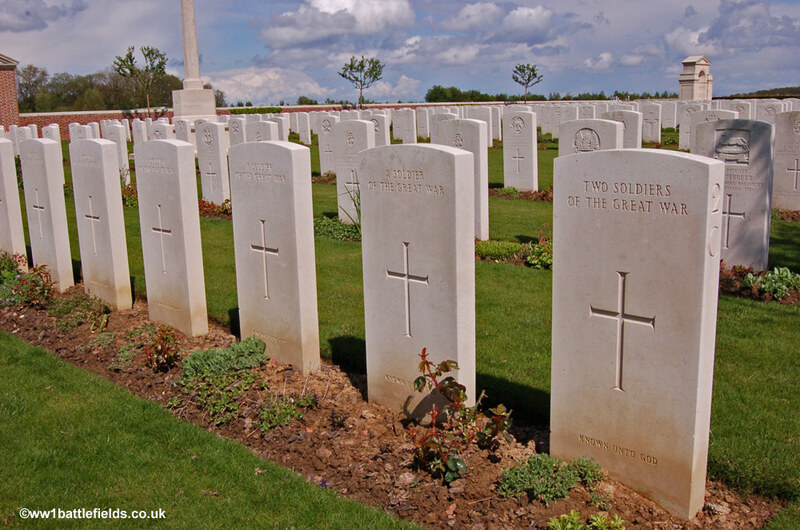 These men are now buried here in Moncy British Cemetery, in the last two rows where the headstones are noticeably newer. Two of these men were identified - Private George Anderson and Private Frank King. 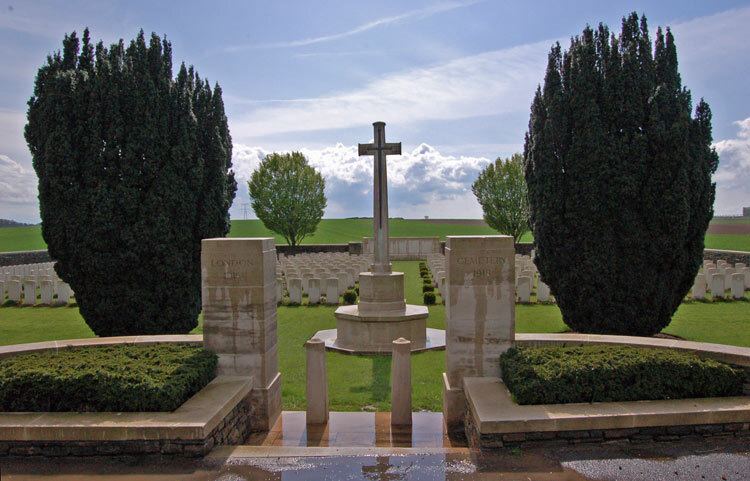 The latter's brother, Albert Stanley King, also died in the Great War, although he has no known grave and is commemorated on the Thiepval Memorial. 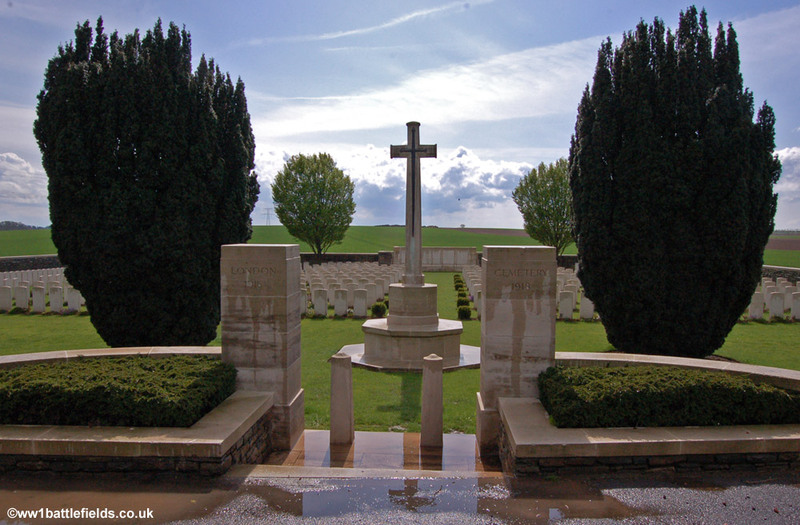 George Anderson and Frank King both served with the 13th Royal Fusiliers (part of the 37th Division - see above for this Division's memorial), and both are recorded as having died on the 11th of April 1917. Another cemetery not far from Monchy-le-Preux is Happy Valley Cemetery. This is to the north-east of the village, and a little off the beaten track, although very close to the motorway. The zig-zagging grass track leading from the road to the cemetery crosses the route of a light trench railway whichran here in 1918. It probably ran very close to the cemetery itself. 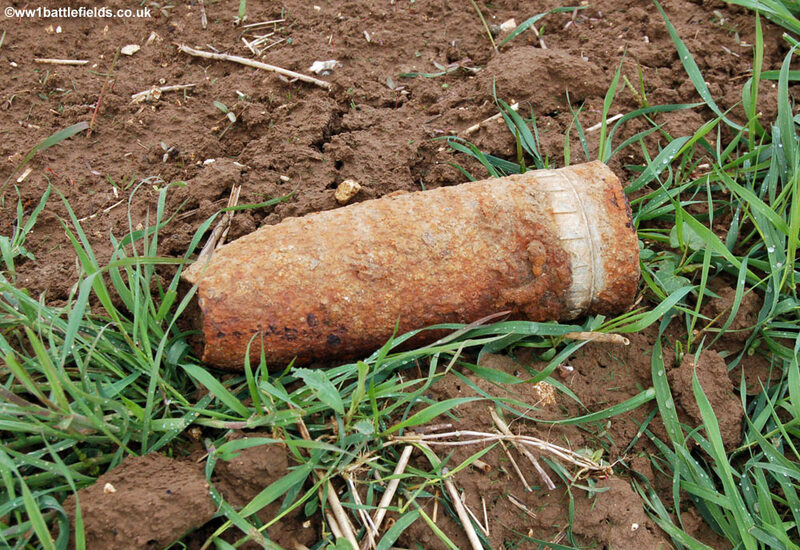 No trace of this remains today, although a sign of the war - a mortar - was lying by the track when I visited. Despite being so near the motorway, there is an element of peace here in this small cemetery. There are just three rows of graves here. Happy Valley itself was fought over on the 10th and 11th of April 1917, and the cemetery was started by the 12th Division after this. It was used again in December 1917, and there are only 76 men buried or commemorated here. 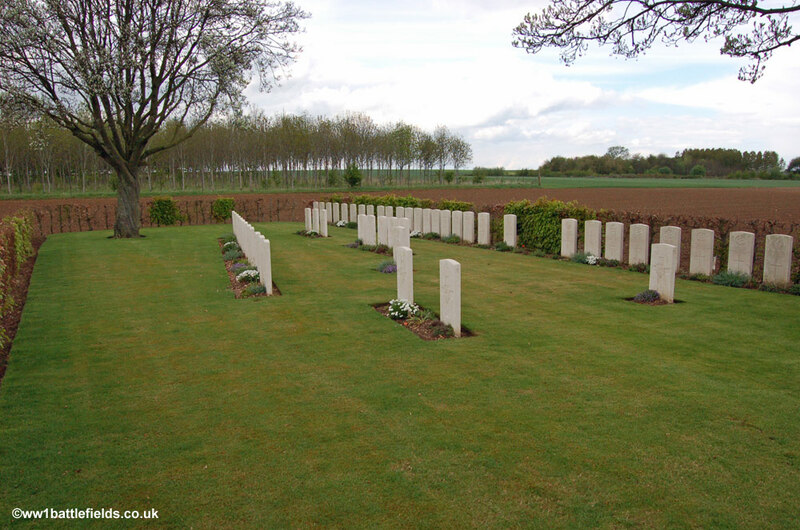 There are six unknown burials, but set at the right hand end of the rows at a right angle is a special memorial to one man known to be buried here - Company Sergeant Major Albert Brown. Brown won the Military Medal twice before he died on the 25th of August 1917 aged just 22. He had first seen service on the Western Front over two and a half years earlier, in January 1915. South of Monchy-le-Preux, the D939/N39 runs more or less east-west, and following it west leads over the A1 Autoroute. A little west of the motorway on the left-hand side of the road are a cemetery and memorial. The cemetery is Feuchy Chapel British Cemetery and standing opposite it is a demarcation stone. During my visit the turf in the cemetery was being renovated, giving it a somewhat austere appearance under a grey sky. 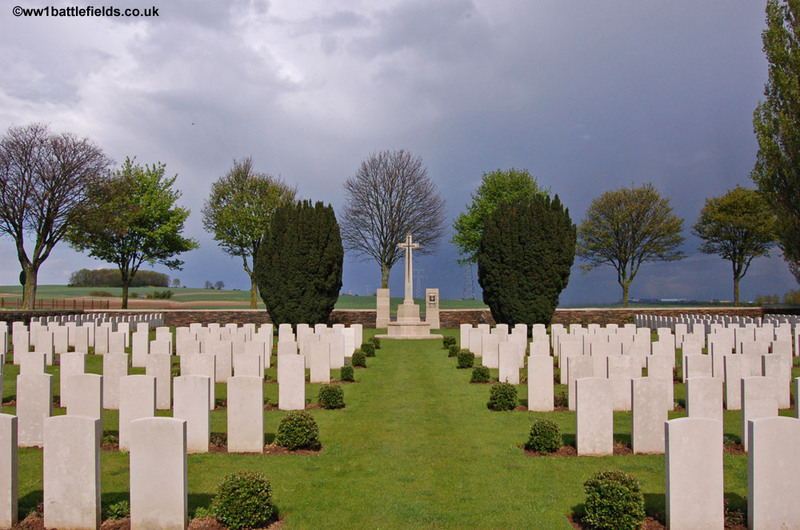 The cemetery was started in May 1917 and also used during the following year.By the end of the War it containd 249 burials, which now form Plot 1 at the front of the cemetery. 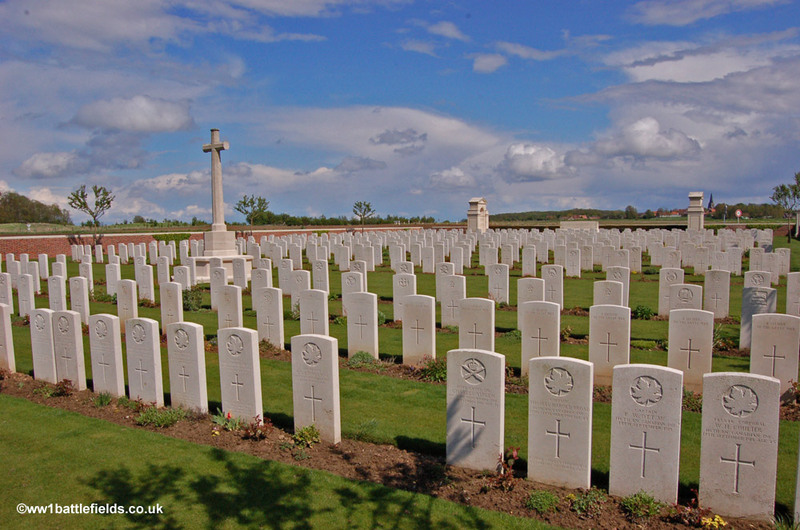 After the Armistice, more graves were concentrated here and today there are 1,103 men buried or commemorated here, although less than half of the burials are identified. Just a little further along the road, on the same side is the 12th Division Memorial. 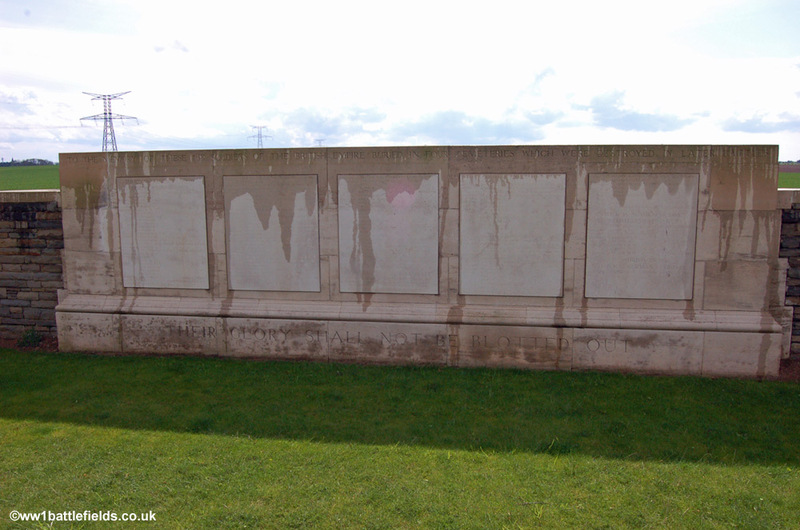 The battle honours of the Division are listed on the panels at the base of the column, with the date 1914-1919 inscribed above. The Division's Heart symbol is at the base. The 12th (Eastern) Division was formed late in August 1914, in Colchester and Shorncliffe. Training was undertaken (initially using improvised wooden rifles) and in February 1915 the whole Division concentrated at Aldershot for the final training. They went overseas to France in June 1915, and remained on the Western Front for the rest of the War, fighting battles at Loos, the Somme (in both 1916 and 1918) and Cambrai as well as in the Advance to Victory in 1918. Just a little further to the west along the road, again on the same side as the memorial and cemetery is another memorial, this time to an individual - Second Lieutenant Henry Isaacs. This memorial is by the next crossroads, where the D37 crosses the N39. It is in a patch of woodland on the left. 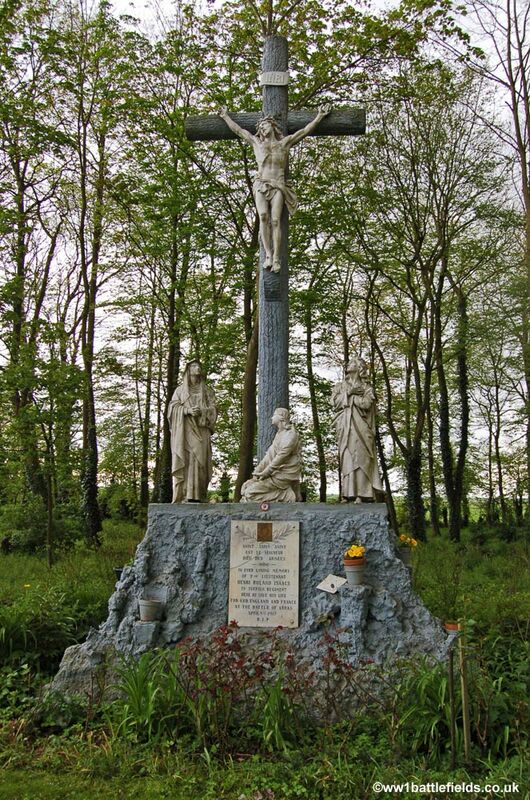 The memorial is in the form of a crucifix on which Christ is nailed, with the figures of three women at the base. There is a plaque with the words "In ever loving memory of 2nd Lieutenant Henri (sic) Roland Isaacs, 7th Suffolk Regiment. Here he gave his life for God, England and France at the battle of Arras, April 9th, 1917. RIP". Henry Isaacs was serving with the 4th Suffolks when he was killed in action on the 9th of April 1917, and with no known grave is remembered on the Arras memorial. 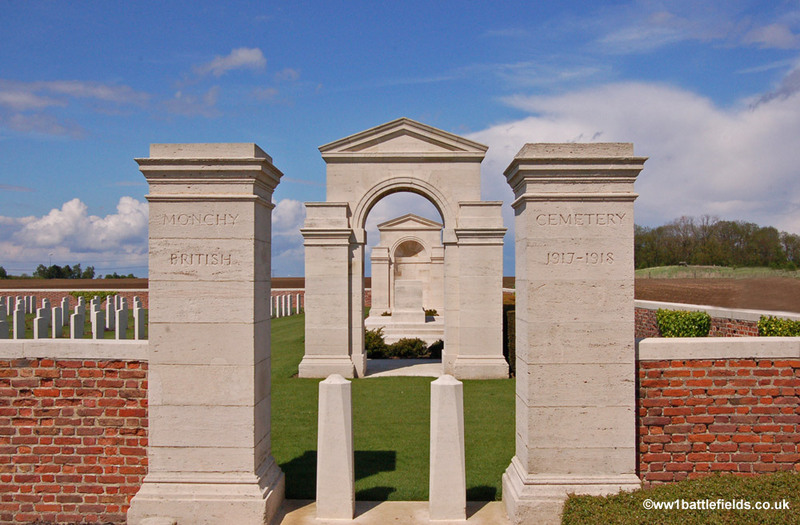 On the road between Neuville-Vitasse and Beaurains (the D5), London Cemetery can be found on the left side of the road as you travel north towards Beaurains. From trench maps, it can be seen that during the war barbed wire ran across what would become the site of the cemetery, as part of the German defences which curved across the road here. The village of Neuville-Vitasse was attacked on the 7th of April, and taken on the 9th, with the atack being undertaken by the 56th (London) Division. 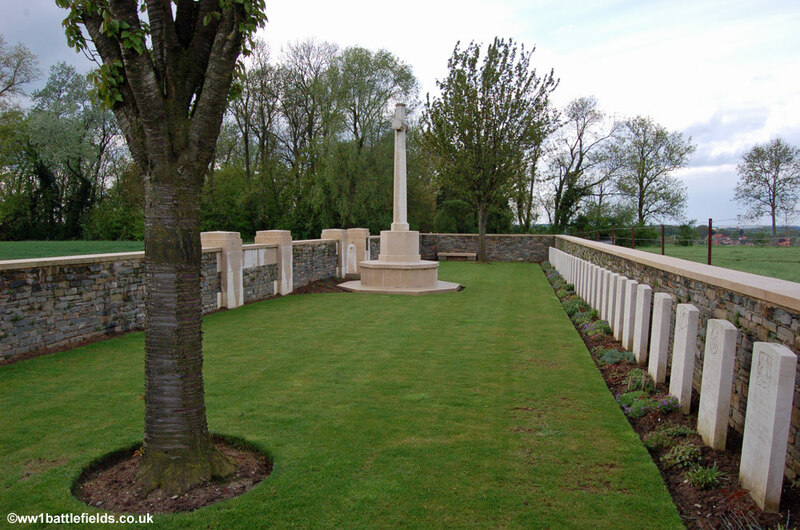 The cemetery was started by the same Division (hence the name) in April 1917 and greatly extended after the Armistice when graves were brought in from other burial grounds and from the battlefields between Arras, Vis-en-Artois and Croisilles. It now contains 747 burials and commemorations of the First World War. Of these, 318 of the burials are unidentified and on a screen wall at the rear of the cemetery are panels listing the names of men who were buried in four nearby cemeteries, whose graves were destroyed by shell fire. The names are divided by the cemeteries they were buried in, and listed in rank order. East of Neuville-Vitasse, and just to the east of the A1 Motorway are the villags of Wancourt and Heninel. A little east of the latter, on the road to Cherisy is Cherisy Road East Cemetery. This is a tiny cemetery, with just a single row of headstones set against the rear wall, all of which bear multiple names. 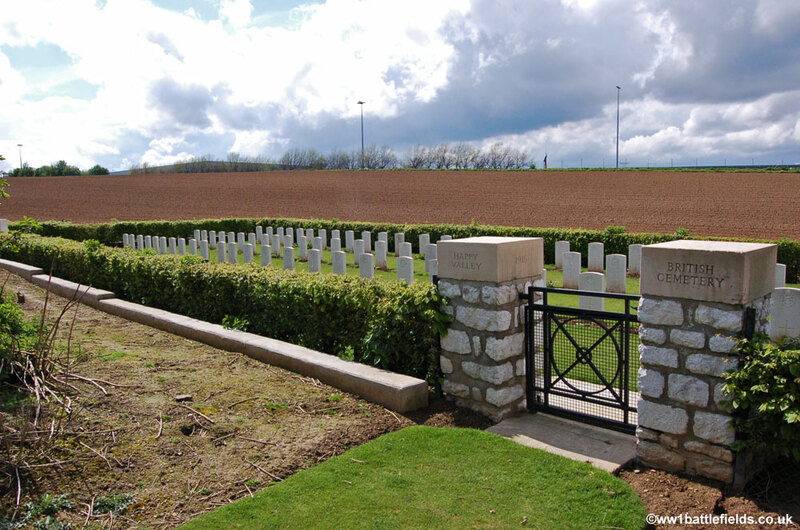 The cemetery was made by the Burial Officers of the 30th and 33rd Division in April 1917, following fighting in the area. There are only 82 men buried here, of whom 19 are unidentified. One inscription which caught my eye here was on a headstone commemorating two soldiers of the 18th King's Liverpool Regiment. It is fairly unusual for the specific battalion number to be shown on the headstone (it is generally recorded in the register). One of the men buried here was Private David Fairweather Jamieson of Arbroath, who died aged 21 on the 24th of April 1917. The other died the day before, and although his battalion and date of death were known, his name is not. One other oddity here was that the plan in the cemetery register shows a grave B1 to the right of the Cross of Sacrifice, but there is no grave there now. This is a quiet isolated cemetery, and silent pickets can be seen holding up the wire in the fields nearby. There is a track next to Cherisy Road East Cemetery which leads towards Fontaine-les-Croiselles. Three more cemeteries can be found along this track. 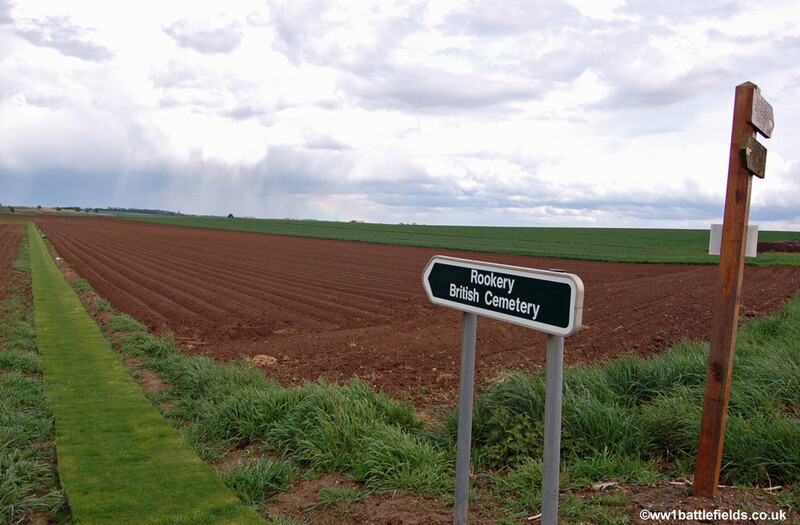 The first is Rookery Cemetery, located off the track to the left, reached by a grass track. 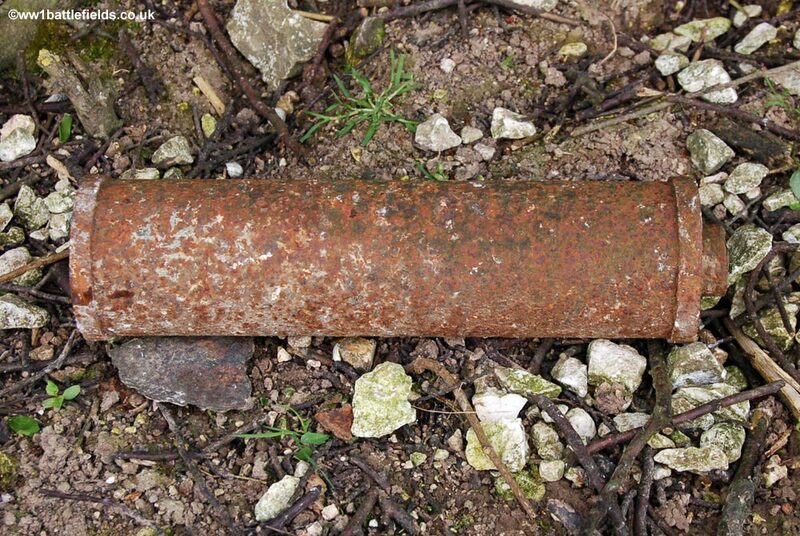 More iron harvest was evident beside the path when I took these photographs. 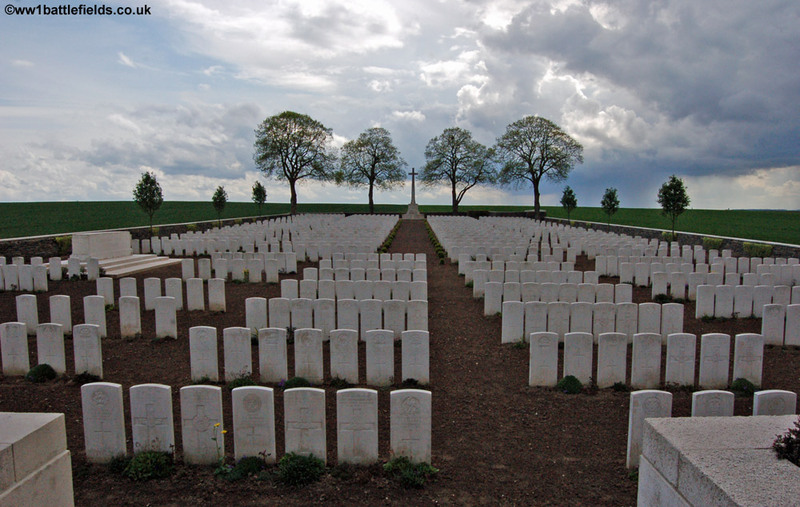 The cemetery, which takes its name from a trench system nearby, has a very irregular layout of graves with short rows set at different angles, and one long row at the back. 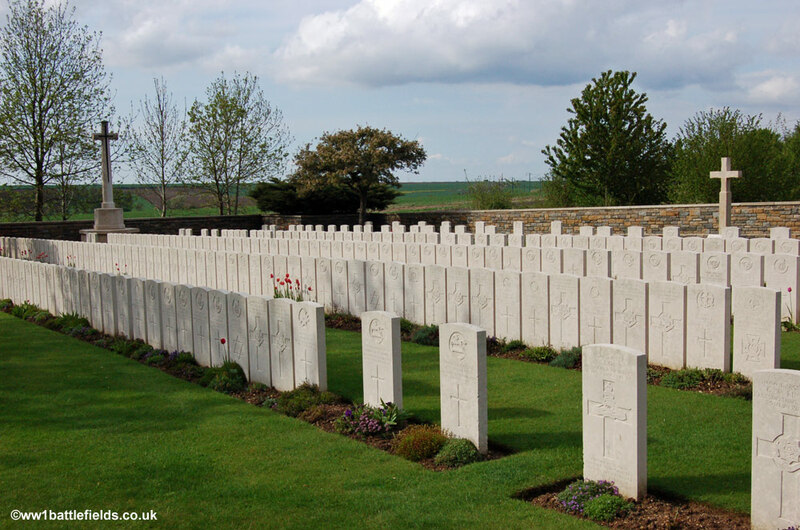 The cemetery was made by the Burial Officers of the 18th and 50th Divisions in April to June 1917, and most of the graves date from June and July 1917 although there are some later burials. There are just 55 soldiers buried here, and only one is unidentified. One of those who died in June 1917 is Charles Allum, buried in grave C6. Charles was a farm labourer from Northamptonshire, who enlisted in his county regiment in March 1913, more than a year prior to the outbreak of the Great War. He was killed in action on the 3rd of June 1917, leaving a widow. Rookery Cemetery is extremely peaceful and quiet, located on a small road that later becomes a track. There is a copse directly behind the cemetery, and although this was not there during the war, large belts of barbed wire ran across where it now stands, and the trench system which gave its name to the cemetery ran through and beyond. A third cemetery nearby is Cuckoo Pasage Cemetery, which again took its name from a nearby trench. Other trenches nearby were also named after various birds, including Eagle Trench, Sparrow Lane and Thrush Lane. Cuckoo Passage Cemetery is located further along the track, which is impassable except by off-road vehicles from Rookery Cemetery onwards. The villages of St. Martin-sur-Cojeul and Henin-sur-Cojeul are located just to the west of the main A1 Autoroute. Very close to the motorway, reached along a small road leading south-east from the former village is Cojeul British Cemetery. This was started by the 21st Division Burial Officer in April 1917, and used until the following October. The layout of graves is fairly regular, although less so towards the rear. The cemetery was badly damaged in later fighting, and 31 graves destroyed by shell fire are represented by special memorials. These are found right at the front of the cemetery, and face the opposite direction to the other headstones. In all there are 349 men buried or commemorated here, of whom 35 are unidentified. The Cross of Sacrifice is located on the left side of the cemetery, and to the rear is a memorial in the form of a stone cross to the 64th Infantry Brigade, many of whose fallen are buried here. 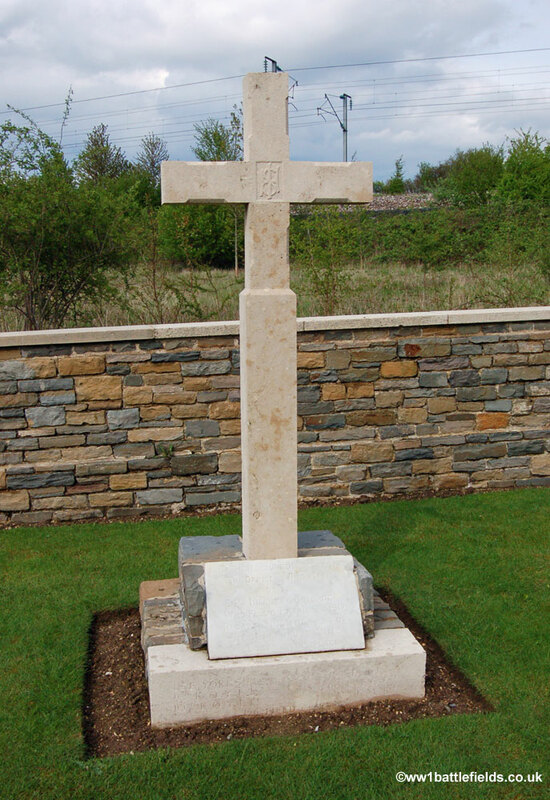 The original memorial cross, made of wood and with a base of cut chalk blocks, was erecetd in May or June 1917. 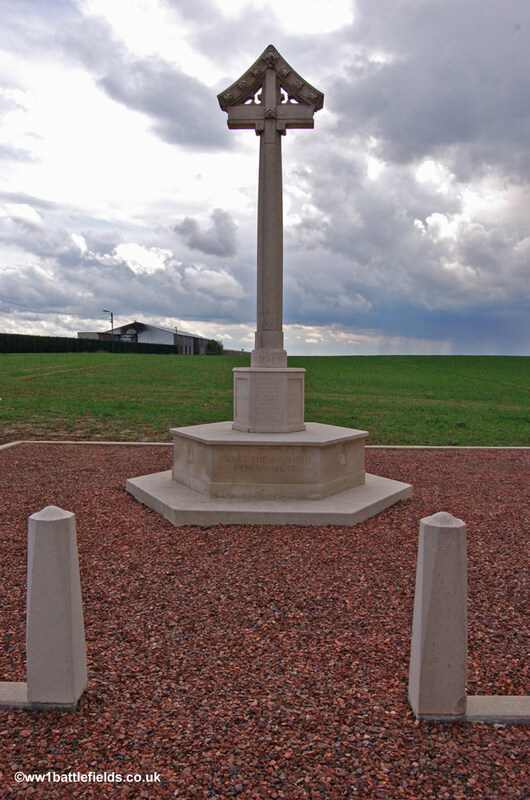 It was erected by the Brigade on Henin Hill, as they had reached the Hindenburg Line on the 9th of April 1917, athough they were without support on both flanks. They held the position until the evening of the next day, repelling several German counter-attacks until they were eventually forced out. 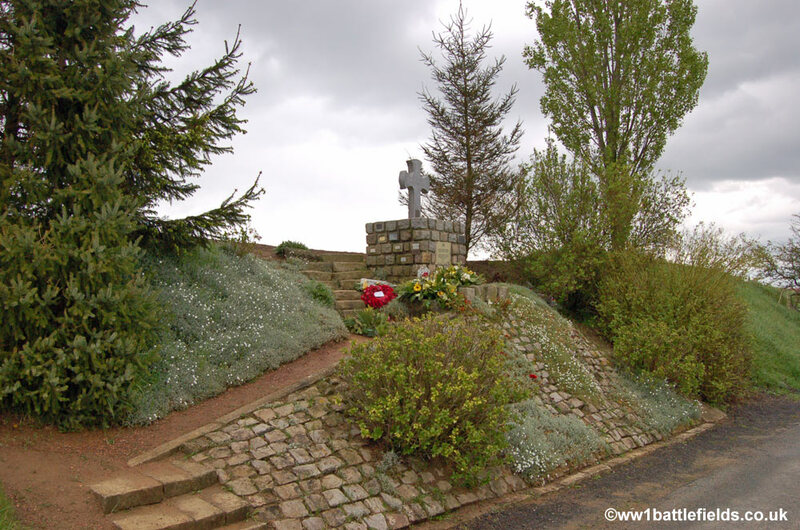 In 1919, the Brigade applied to the Battle Exploits Memorial Committee to retain the memorial they had put up to commemorate their action on Henin Hill. This memorial does not appear on the plan of the cemetery available online from the CWGC, although the original application to the BEMC states 'The memorial stands in a graveyard where about 100 men are buried'. However, the map refeence given (roughly T 5a on sheet51b) would suggest a position some half a mile east-south-east of Cojeul Cemetery, a spot actually within a German trench complex. An early photograph of the original memorial cross in situ is held at the National Archives, and shows graves behind the memorial (based on the position of the inscription plaque), rather than in front of it, as today. The memorial plaque appears to be the same today as it was when the photograph was taken in 1919. It was confimed in October 1920 by the IWGC that the original map reference was incorrect, and that the memorial was actually at 51B.N.34.c.4.3, and was 'immediately in front of Cojeul British Cemetery'. 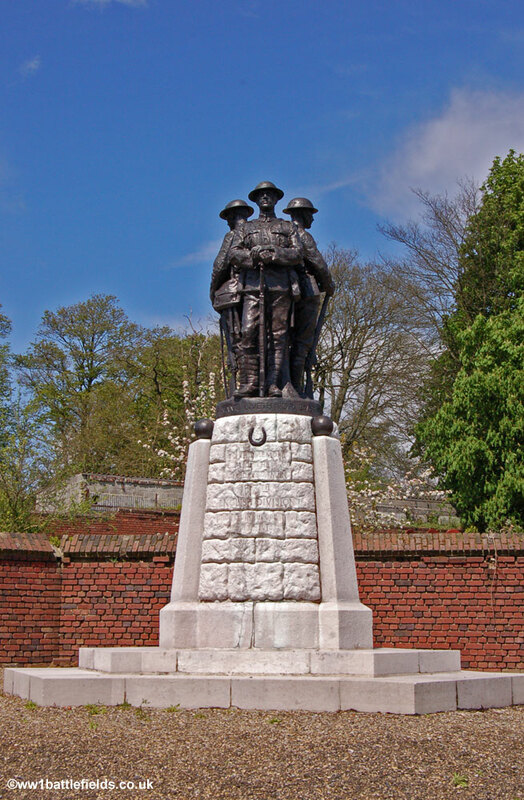 In August 1922, the BEMC wrote to the 64th Brigade representative that 'the memorial is in a bad state of repair, and ......must be taken down and re-erected on a concrete foundtion'. The IWGC agreed it could remain within the cemetery (which was not general policy), if it was taken down as requested and re-located 'at another spot in the cemetery at the north-west end'. So it would appear the memorial was moved, but within the cemetery, and it may have been at that time that the original wooden cross was returned to England, as the original wooden cross can now be seen in Beverley Minster. It is unlikely that, as stated by some, the memoial was moved from some way away into the cemetery at a later date. The cross that can be seen today (unveiled in 1931) is constructed of stone, with a symbol where the upright and horizontal members meet. The original plaque reads 'To the honoured memory of the Officers and Men of the 64th Infantry Brigde who fell on April 9th 1917 in capturing the part of the Hindenburg Line close to this place'. On the very base are inscribed the units which made up the 64th Brigade - the 9th and 10th Kings' Own Yorkshire Light Infantry, 1st East Yorks and 15th Durham Light Infantry, along wih the 64th Machine Gun Company and Trech Mortar Battery and the 126th Field Company of the Royal Engineers. The 64th Brigade was part of the 21st Division serving, on the Western Front from September 1915 until the end of the war. An excellent website by Andy Lonergan covering the 21st Division has more information. On the 11th of April at 4.30 a.m., four British tanks set off over snow covered ground to attack the German lines at Bullecourt. Two were put out of action and two returned damaged. However, instructions issued to the German soldiers on how they should deal with the attacking tanks make interesting reading. 'Ordinary wire entanglements are easily overcome by tanks. Where there are high, dense and broad entanglements.....the wire is apt to get entangled with the tracks of the tanks. Deep trenches, even eight feet wide, seem to be a serious obstacle to tanks. At long ranges by day, tanks will be engaged by all batteries that can deliver fire with observation......Battery commanders must be permitted to act on their initiative to the fullest possible extent.....Fire directed at the sides of tanks is more effective than fire at the fore end. The greatest danger for the tanks is the ready inflammability of the petrol and oil tanks. Machine-gun fire is capable of igniting them. The garrison of the trench will take cover behind the traverses and will direct their fire at the hostile infantry following the tanks - firing on tanks with ordinary small arms ammunition is useless'. A small road runs between the villages of Bullecourt and Riencourt-les-Cagnicourt. On this road are two memorials. 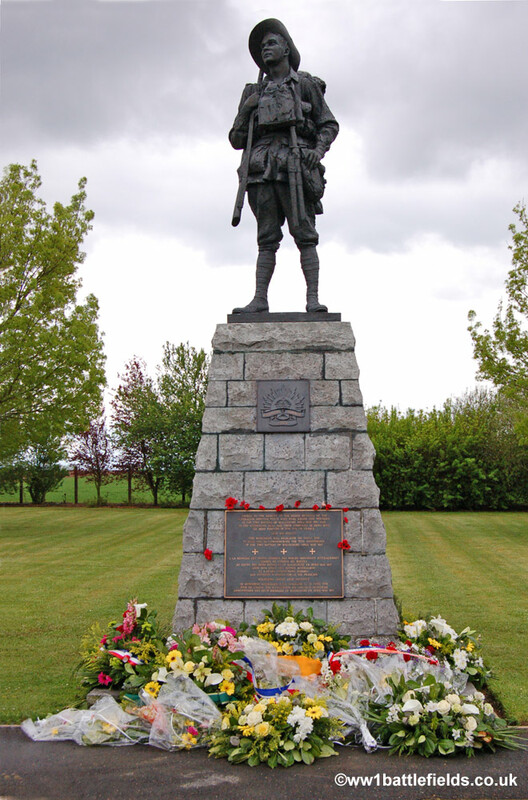 Nearest Bullecourt is the Australian 'Diggers' memorial. At the entrance to the site is a Ross Bastiaan bronze tablet, as found at other sites associated with the Australians on the Western Front. This gives some background, stating that the Australians were ordered to advance here 'across open snow-covered ground on the morning of 11th April'. After a German counter-attack they were forced to retreat, taking about 3,300 casualties from a force of 5,000 men. The Australians attacked again here on the 3rd of May. This time, the position was held, and slowly consolidated, with the Germans withdrawing on the 20th of May. On this occasion there were some 7,000 Australian casualties. An information board explains the memorial, which was sculpted by Peter Corlett. 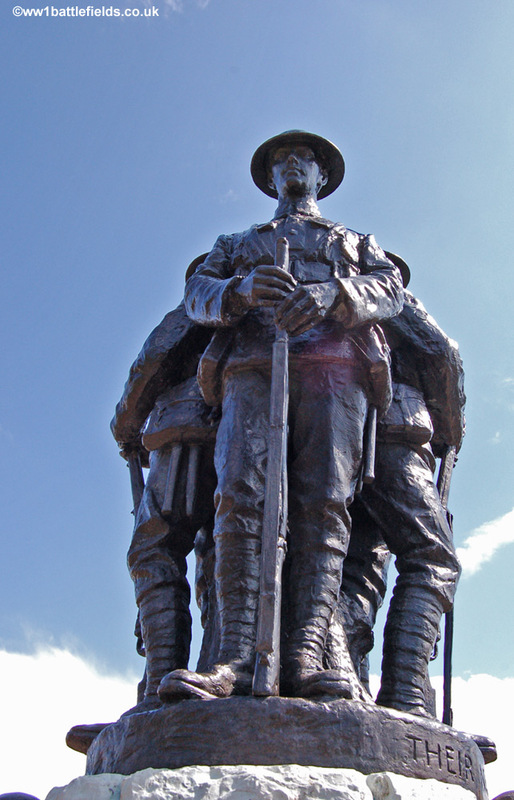 Corlett's father had fought at Bullecourt, and he used a photogrpah of his father when sculpting the memorial, which was unveiled in 1993. On the plinth of the memorial is the crest of the Australian Imperial Forces, and also a plaque which reads ' Sacred to the memory of the 10,000 members of the AIF who were killed and wounded in the two battles of Bullecourt, April-May 1917, and to the Australian dead and their comrades in arms who lie here forever in the soil of France'. 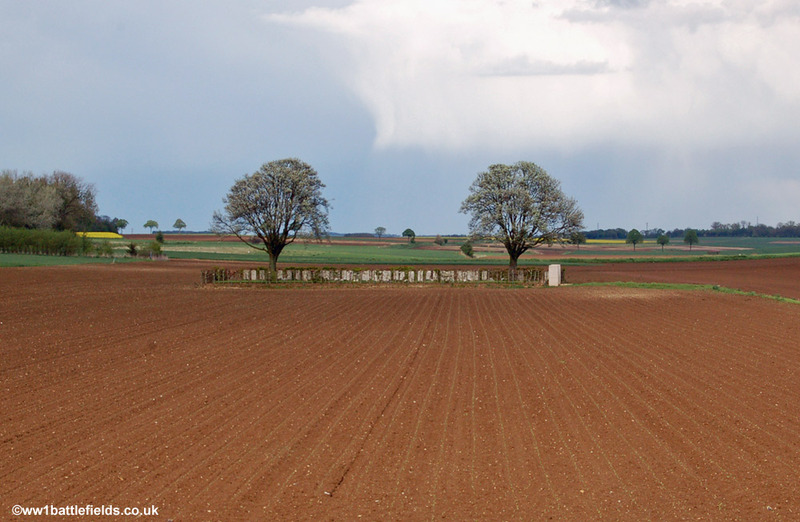 A little further along the road towards Riencourt-les-Cagnicourt is the Bullecourt Memorial. The main plaque states 'To the glory of God and in the memory of 2423 officers and other ranks serving the Australian Imperial forces who fell in these fields and have no known grave'. An Arras man, Andre Coilliott, the Australian author John Laffin and the late Tony Spagnoly were involved in this memorial. Smaller plaques have since been attached to the memorial, commemorating units who fought here and remembering individials who died. For example, Private Alfred King of the 57th Battalion who died on the 12th of May 1917 near Bullecourt was remembered by his sister, Glady, of Port Melbourne. The 57th Battalion War diary records that their support line was "terribly blown about" by a German bombardment that day. Alfred was originally commemorated at the memorial at Villers-Brettoneux, but is now buried in London Cemetery by High Wood on the Somme, his body presumably having been found at some point after the Second World War and prior to 1955 (when a note of his place of burial was inserted in his file).